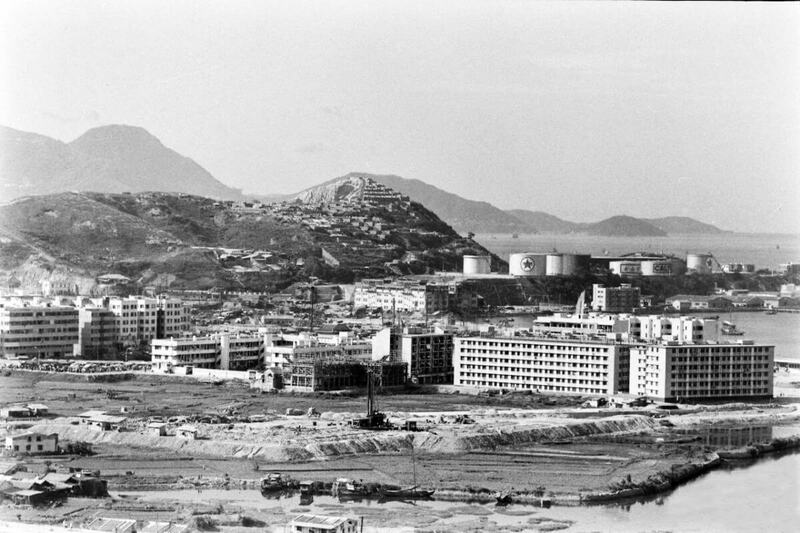 HF: The image below shows the developing Tsuen Wan in the foreground, the Caltex oil storage depot in the background with a hill top cemetery above. JKW: I can confirm this, because I grew up here. My father worked for Caltex as a civil engineer supervising work at the oil terminal, as he called it, from 1973 to 1978. We lived at the back of the terminal for 5+ years in the 1970s in an old house on the hill just above the tanks. I remember that cemetery well – I’m pretty sure we had ghosts because of it. ADW, JKW’s father confirms that the photo does indeed show the Caltex Oil Terminal in Tsuen Wan. ADW continues, “I reported to Hong Kong in June 1973 for duty as Assistant Terminal Superintendent. As the photo shows TWT (Tsuen Wan Terminal) was on a levelled-off hill, but a part of the hill was left to install a mast for the storm signals. Whenever HK had a typhoon alert the appropriate day shape was hauled up the mast by terminal staff. This custom was left over from the “days before” when modern communications and storm warnings didn’t exist for the local fishermen. Archie Chan (Chan Tai-Wing) was the Supt; he and Anson lived in the large house on the hill at the rear of the terminal, with, like us later in the duplex, a stunning view of the cemetery. Across the Rambler Channel from the TWT was the Esso terminal, with four 500K bbl fuel oil tanks that in very large letters spelled ESSO. The Caltex Oil Terminal handled gasoline, diesel, jet fuel, fuel oil, kerosene, toluene, white gas, LPG and lube oil. Its main supply was from the Caltex refinery in Yeosu, South Korea, using a dedicated 20,000 ton tanker which once, in murky circumstances, ran aground on a small island in Repulse Bay. It had no business being there and supposition was that it was smuggling people or goods from Korea. I am unable to remember the name of this vessel. Gasoline and diesel went to company service stations in Caltex-owned trucks; other destinations were supplied using contract haulers. Two major customers for lubes were Kowloon Motor Bus and China Motor Bus and these were blended at the terminal using base stocks from Australia and additives from the US. Kerosene and white gas were for cooking and lighting but these products were both left over from years ago and the demand for them was shrinking. Toluene was important to the plastics plants in HK. Parts of the Terminal were old. One of the tanks was built around 1936, of riveted construction rather than welded, and it was badly damaged by Japanese bombing during the war. It was taken apart, rivet by rivet and plate by plate, then the plates were beaten back to semi-flat using sledge hammers (the marks were clearly visible on the plates) and re-riveted. The rebuilt tank only leaked a little so it was used for lube base stock because lighter products such as diesel would have spurted little fountains all over it. The newer tanks, only about 80 feet from the duplex apartment where we lived at first, were in jet service and it was very handy they were so close when I needed starter fluid for the barbecue. Once a week I went to the main office in Central which was located on the corner of Queen’s Road and Ice House Street. I would walk from TWT to the ferry terminal in Tsuen Wan, sometimes getting lucky and ride a hovercraft to Central, then walk from that ferry landing to the office. There were water shortages, and sometimes there was severe rationing. It didn’t affect us because TWT was in an industrial zone and these areas got water, at the expense of residential zones, because keeping the factories running was considered more important than taking a bath.